The world we live in today is hectic. That is not to say that generations from years past did not have their own share of daily professional, personal and social requirements, but it is true the world today is a much faster place. This is probably one of the reasons that the traditional bathtub is not used nearly as much as it was ten to fifteen years ago in the Toronto area. People are in a hurry; they typically need to get in and get out without the effort it takes to draw a bath and soak for half an hour or longer. For this reason it may seem to some that actual bathtubs have gone out of fashion, but we here at Stone Masters have never given up on the tub as the primary source for bathing and we know that even if it is not used frequently, people like to have a place where they can get away from it all. We also understand that when a potential buyer enters a home that they may choose to purchase they will inevitably check the bathrooms and hope to see at least one nice tub. Reasons for this vary, but when it comes to a guest bathroom, you never know who might be coming for a visit and if they have small children or some other special requirement, they may indeed need a tub. At Stone Masters we offer a wide selection of beautiful tubs that are guaranteed to be the highlight of any bathroom. 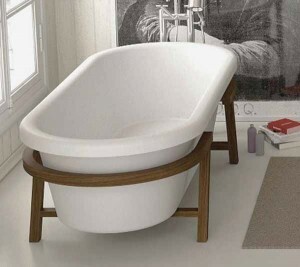 Our primary tub is made from beautiful Travertine and comes as a free-standing model that is perfect for users of any age while maintaining a classic look that is an excellent addition to your bathroom no matter what the decor. Our Travertine tubs at Stone Masters here in Toronto come in varying depths depending on your preference and we can tailor the colour, shape and length to your liking. Our materials are primarily imported from Europe and are shaped according to our customers’ requests when the sale is made. For this reason you can expect to get a custom bathtub made just for you when you purchase from us. Travertine is a beautiful surface that seals against moisture retention and naturally prevents mold growth, which is usually a concern for folks who consider tile around their bathtubs. In addition to our tubs we here at Stone Masters also offer shower bases made of our European imported Travertine and we can make them in virtually any shape that you might need. A quick call to one of our trained, certified customer service representatives can get you setup with the shower base you want in a beautiful colour no matter what the size or shape. No matter if you are making a base for your standing shower or upgrading your bathtub, we at Stone Masters have a variety of options that will accommodate whatever your preference is for your bathroom. Our Travertine tubs are some of the industry's finest and we will do whatever it takes to make your bathroom into the oasis that you envision it should be. The traditional bathroom tub still has its place in the Toronto home. Even if you have a small bathroom, one of our custom tubs still might fit. A shower may seem like the conventional choice in modern houses or apartments, but it’s still nice to have a tub as well. You never know who might be visiting in the future. Some of your guests may have special accessibility needs. Plus, there’s nothing like enjoying a hot bubble bath after a hectic, busy day. Natural stone makes a bold statement in any home. We offer Travertine tubs made from high-quality material imported from Europe and shaped in accordance with the customer’s requirements. If you’re after a custom-tub, you’ll find one right here. Travertine is a stunning surface that seals against moisture retention. Our bathtubs come in four shapes: rectangular, round, square, and neo-angle. We also offer shower bases, which can be shaped in any way you need. Where exactly do you want the tub located? In a smaller bathroom, there aren’t many choices. It’s ideal that you stick with a tub that measures 5-feet or less in length. Installation against the wall is usually recommended. Another option is a neo-angled shower base installed in the corner. For recessed or corner tubs, the drain is available at either end in order to accommodate plumbing. These units typically have wall-mounted faucets, and are easily configured to incorporate a shower. Freestanding tubs are more versatile in how they can be placed, as they don’t require special faucet drilling. It’s possible to integrate a shower into some freestanding tubs, although it’s not something commonly done. The tiles surrounding the tub or shower base should match the style of the tub. Stone Masters carries over thirty different types of stone mosaic tile for the bathroom, many of which match well with travertine tubs. When ordering from us, you can get your dream bathtub in whatever size you need. Whether you want a shower base, corner tub, freestanding tub, etc., we will custom-make it so that it fits exactly where you want it to fit. 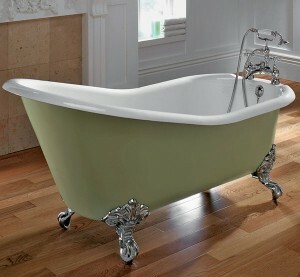 Our bathtubs come in varying depths and we can tailor the colour and shape to your liking. It doesn’t matter what kind of interior design scheme you are trying to achieve, our Travertine tubs look great in both traditional and modern bathrooms. In addition to tubs and tiles, we also offer custom countertops, sinks, and vanities. Our customer service representatives have interior design knowledge and experience. All it takes is a quick call or email and we will help you get started with your new Travertine bathtub and more.